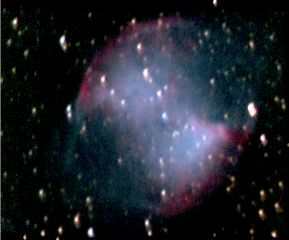 Long exposure deep sky image taken with a modified colour webcam. The previous spacecam long exposure mod takes what is a cheap insensitive camera and increases the exposure time to 4 seconds which puts it on a par with low light video CCD's. This mod goes one step further by starting with a good CCD based webcam and making possible exposure times limited only by tracking precision. Maybe we will soon see a ST4 guided cooled vesta picking up GRBs! The vesta's sony CCD is controlled by a Phillips SAA8115hl though a NEC PD16510 driver. The mod obtains long exposures selectively blocking the charge transfer pluses and stopping sub pulse before they reach the driver. Although developed on a vesta this modification should be equally applicable for any ccd driven with the PD16510. (Apparently this includes 675 680 and 690 from Philips). The exposure is controlled using a line from the PC's printer port and the image is recovered over the normal USB connection. If the control lead from the PC is not connected the camera will output images as normal; except in making the mod you will disable the shutter (if used without the PC controlling the exposure this is equivalent to a 1/25sec shutter). 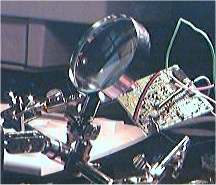 Alternatively a switch may be added to re-enable the shutter function allowing planetary imaging. If you are interested in making the modifications, firstly read though these instructions with the webcam PCB in front of you. The mod is not difficult to make but does involve soldering on a small scale (its more a question of confidence than skill!). If you decide your soldering is not up to the task it would be possible to have the modification to the camera PCB made by an electrical repair company and do the control board yourself. 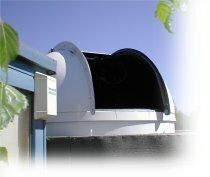 Remember the cheapest alternative for one shot colour deep sky imaging costs £600. If you are going to do the work yourself then a gadget to hold the PCB behind a magnifying glass is going to be a great help. The tools you are going to need include. Fine tipped soldering iron, solder wick, multimeter, magnifier, and patience.